This week I am continuing on from last weeks post about post-baby outfits! As I mentioned last week, I have recently realised that I don't have much of my pre-pregnancy wardrobe with me here in Liverpool as most of it is in storage in Devon - oops!! So I've been concentrating on picking up some bits & pieces to wear in the 6 weeks following the birth - as during that time I will still be in Liverpool without access to my pre-pregnancy clothes, and feel that I will need non-Maternity clothes but will probably not be straight back into my pre-pregnancy size! So I need some inbetween clothes. I hit the New Look sale this week and managed to pick up quite a few things to see me through for now - I went for loose fitting leggings and baggy tops and jumpers, as I don't know how long it will take for my c-section scar to heal and want to make sure that I'm comfortable. I went for the standard range in sizes 16 and 18 - they fit me currently snugly with the bump, so once the baby is out they should be absolutely fine! This jumper was actually not from the New Look sale, it was a gift from Bean Daddy for Mothers Day - I saw it in Asda a few weeks back and it really caught my eye! I wished I'd bought it but when I went back there none left. Luckily Bean Daddy had secretly picked one up for me! I love the bright green colour, its really soft and comfortable and I love the exclamation print - this was priced originally at £14 but I believe its now in the sale for £9! This dress was another gift from Bean Daddy for Mothers Day - he loves these baby doll dresses and always says that they really suit me, so I wasn't surprised to open this on Mothers Day at all! The ditsy flower print is very pretty and it is nice & comfy (and will look much better once the bump is gone as its a bit snug right now!) - I think it will be nice to wear with my trusty black cardi! This red top caught my eye as I love red and own very few casual clothes in the colour - It is nice and loose, so I thought it would be something very comfortable and easy to wear! The top has gold button detail on each shoulder which I really liked. I bought this top as it has a real nautical vibe to it, which - as I've mentioned before - I love for Easter so I thought it would be handy for over the Easter weekend! It will hopefully look better than this once the bump has gone down as its a bit too snug in that area at the moment! This jumper again fits in nicely with the nautical theme, so I will wear it over Easter - its very comfortable and I plan to wear it with this cream coloured flower accessory to spruce my hair up if I haven't got the energy to wash and style it so soon after the birth! I also picked up these cute nautical navy pumps - I love the detailing on them and they are super comfy, and will match all of my nautical inspired outfts! 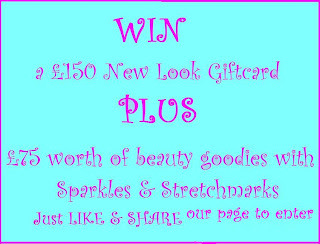 Have you entered my competition to win a £150 New Look Giftcard, £75 worth of beauty products and the chance to win an additional MYSTERY prize?! Great outfits! I love the pumps, the babydoll print dress and the top with the bow the most, really nice! Thank you! :) Can't wait for them to fit properly lol! Thanks! I LOVE Nautical, especially for Easter! We always used to wear sailor dresses at Easter as kids and its stuck with me lol!